Not all work and repair around your home are to keep the AC running or the roof from leaking. Often times, projects are started to make your living space more enjoyable to live in. It can be new paint or as complex as remodeling a kitchen. What has become increasingly popular are quick do-it-yourself projects that have a huge impact on the look and feel of your home without breaking the bank. One such addition is the wood beam. 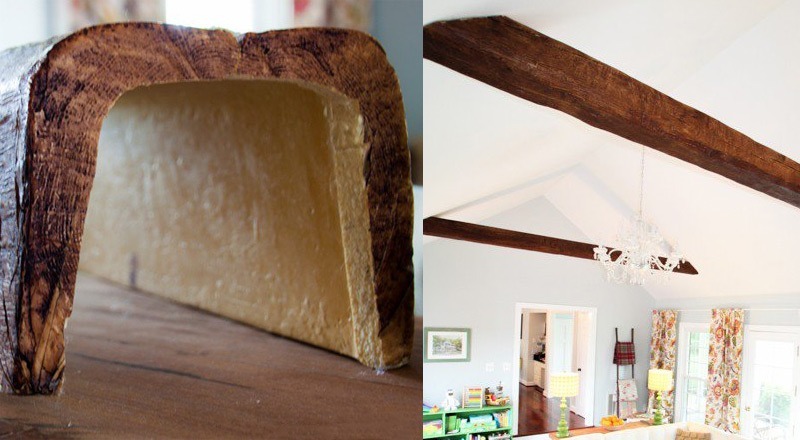 True structural wood beams are beautiful but also very expensive. Overkill for most mobile homes, but the look can add a ton of character to your home for just a few hundred dollars if you use a bit of creativity and don’t mind doing the work yourself. This option is great if you have some basic DIY tools and know how. This would only require the minimal amount of tools and can be one of the lowest cost options available. Here, you use wood planks to build a box to a shape that resembles a beam. The materials can be found at any home improvement store and you will find that a $200-300 investment can totally change the look of a kitchen, living room, or bedroom. There are several ways to do this but you can read more about how the picture above was achieved at jennsuedesign.com. Some folks get concerned about the seams showing. Some will use bands to cover the seams (as shown above), or you could follow this tutorial to build beams without visible seams. This option is for those who have a limited skill set or desire to build their wood beams from lumber. 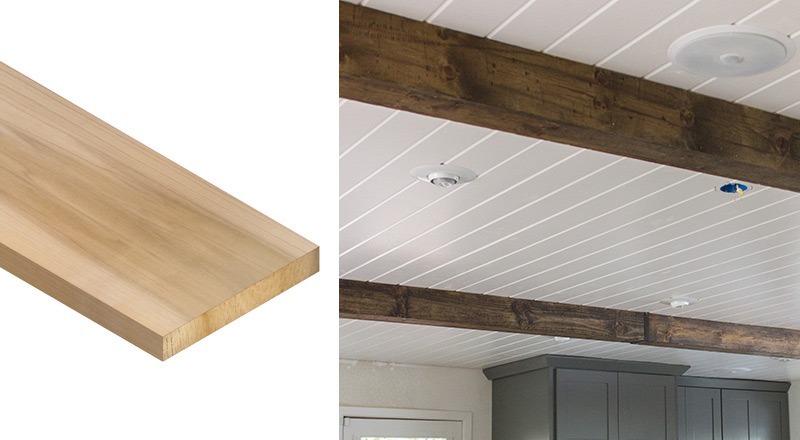 Here you can use pre-made faux wood beams that are ready to install. There are literally dozens of colors and finishes to choose from. 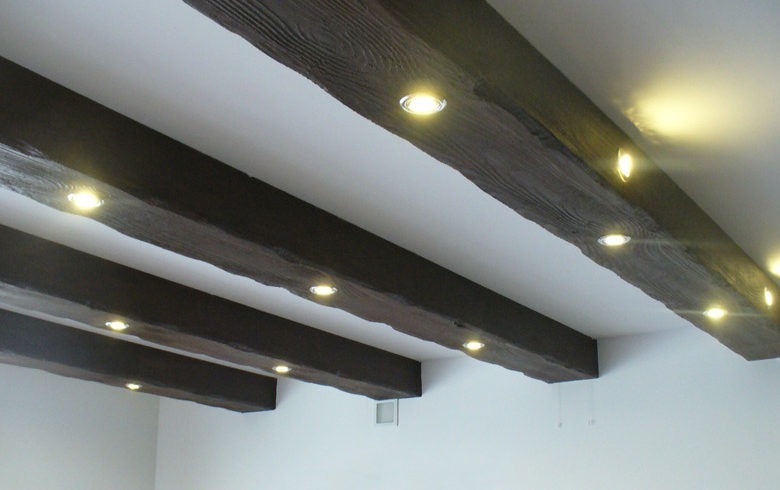 While not as inexpensive as building your own from lumber, many faux beams are much cheaper than the real thing and much easier to install. Easy to find/order at places like Home Depot or even Amazon. The images above are from designtrapped.com. 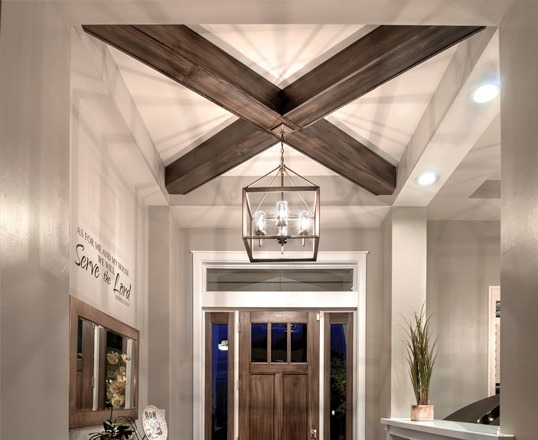 They have a great write up about how they chose and installed the faux wood beams. Be sure to take a look. 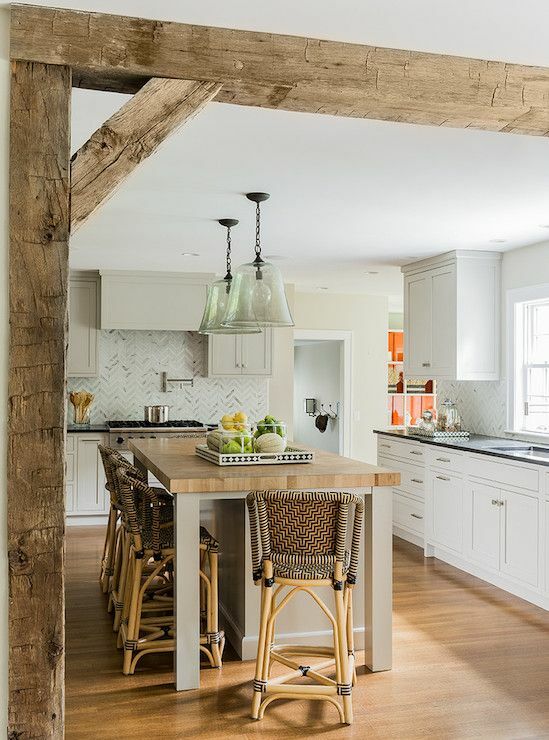 Add some barn flare to your beams with supports. Using beams in unconventional directions gives a unique look. 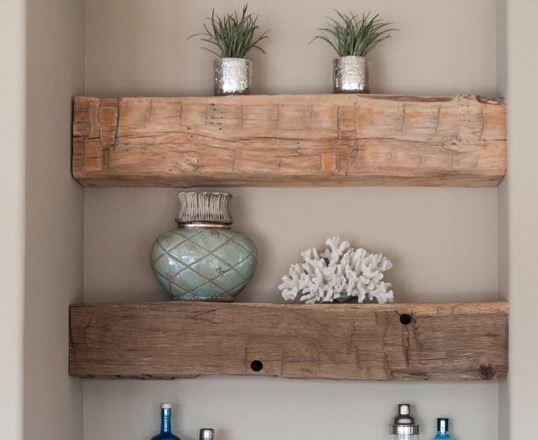 If you have any extra material after you finish your beam project, consider using the leftovers to accent your home with a shelf. Have other ideas? We are sure that you do. With endless designs and finishes, we cant cover all the options. But, we would love to see and hear about them. Please share your thoughts by leaving a comment below!